To use materials effectively, their composition, physical and mechanical characteristics, and microstructure must be accurately determined. 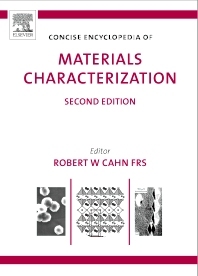 The second edition of Concise Encyclopedia of Materials Characterization covers the wide range of characterization techniques necessary to achieve this. With over 130 articles taken from the award-winning Encyclopedia of Materials: Science and Technology, containing revisions and updates not available in the original set, this concise encyclopedia is an ideal quick reference for materials scientists, chemists and engineers. Robert S. Cahn received his B.S. from the University of Chicago in 1966 and his Ph.D. in Mathematics from Yale University in 1970. From 1970 until 1982, he was a member of the Department of Mathematics and Computer Science of the University of Miami and of the Mathematics Department of Lehman College from 1983-1985. In 1986 he joined the IBM Communications Department working on network design algorithms and network design tools. He has also designed a number of very large, high-speed networks for both IBM and IBM customers. He is the author or over 20 research articles spanning his various interests. He is adjunct professor of Computer Science at Polytechnic University and regularly teaches about network design.